Kai Housewares is your source for kitchen and housewares products from the Kai Group, Japan. Kai products include the Pure Komachi 2 line of kitchen knives that brings brilliant colors and sharp performance to your kitchen and the Pure Komachi HD line that makes kitchen color even more dramatic with a high-definition photographic coating on the razor-sharp blades. This is the most colorful cutlery we’ve ever created. 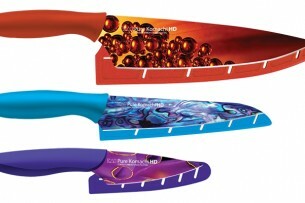 We took beautiful, full-color, high-definition photography and heat-transferred it onto each Pure Komachi HD blade. What’s more—unlike some other colorful cutlery—Pure Komachi HD knives have been been hand-sharpened on a whetstone and hand-finished on a leather honing wheel for a finer, sharper edge. The 16° cutting angle each side provides top performance. 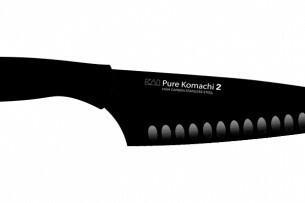 The Pure Komachi 2 Hollow-Ground Santoku’s Asian-inspired blade works well for any job for which you’d normally choose a chef’s knife. Yet the santoku’s shorter length and blade design make it highly maneuverable. Many cooks find they prefer it to a chef’s knife for most kitchen tasks. This one is not only razor sharp, it also features hollow-ground indentations on the blade that help food release more easily, which is especially handy for any slicing or chopping task. The sophisticated black color adds a touch of class to any kitchen.